A national charity trust named the Urostomy Association is dedicated to supporting the interests of individuals with a urinary diversion. The trust, founded in the UK, offers world wide support, encouragement, and practical information to individuals who’ve undergone surgery and have a urostomy as well as to those who may need to undergo a surgery for the same. The Urostomy Association has been able to promote awareness, gain support, and reach out to a wider audience through their website: www.urostomyassociation.org.uk. The organization is built of individuals who are dedicated to improving the quality of life for those who have a urinary diversion. They also offer advice and support to the families and caretakers of the individual before and after surgery. The Urostomy Association offers many levels of membership worldwide for those seeking advice, support, information, or even who wish to further the cause. In order for awareness, information, and support to be available to the public, the Urostomy Association needed a website that could correctly portray their mission. The trust was in search of a website that was eye catching, but at the same time user-friendly and informative. It had to be a website that individuals from all walks of life could relate to. Pulse Solutions built a website for Urostomy Association using PHP, MySQL, and WordPress. The outcome was a user-friendly, calming-blue back-dropped website featuring information on support branches, journal information, support for family and friends, as well as information on how to become a part of the trust. 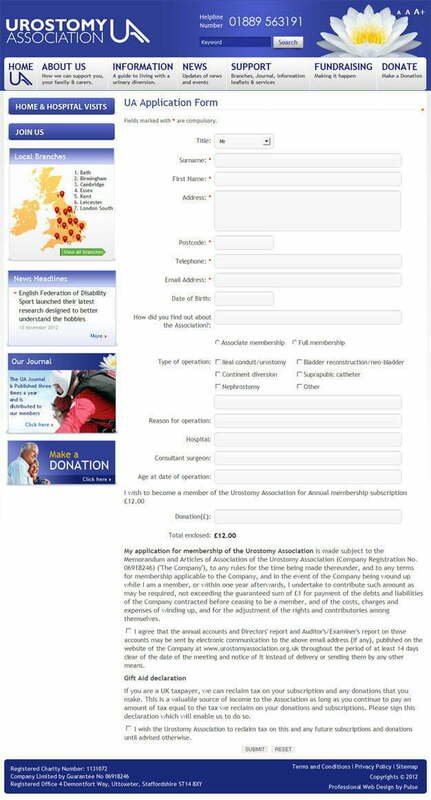 The website allows for easy navigation through the various aspects of the trust—the history, national executive committee, research on the subject of urinary diversions to date, and membership and contact details. The website has helped improve the lives of many individuals who are faced with the challenge of living with a urostomy. It has also furthered the mission of the Urostomy Association.